My older sister, Fanny, put me in a closet once when we were children. She, being the elder, had her reasons, I suppose. I can think of half a dozen reasons right now why she may have done it. I was always a plague to Fanny. Like the time I stole her pearl hair comb when she was going to a party where Herman Melville was to be guest of honor. Mr. Melville came from Troy, New York, where I come from. We have both a small farm and a town house in Troy, across from the Hart-Cluett mansion. Life there was not dull. But it was confining. Before I made the decision to come to Washington City, my life was like I was in a closet. Always I was watched. Always I was under someone else's supervision. If it wasn't Fanny's, it was that of one of my older brothers or sisters-in-law, who were, in their own words, "taking the problem away from my parents." Or it was the teachers at Troy Female Seminary. That was on Mount Ida, above the city, where in the rarified air I learned how to stand straight, play the pianoforte, and stitch a fine seam, to say nothing of science, mathematics, French and philosophy, deportment and dancing. "Face your problems head-on, girls. Stare them in the eye," Miss Semple used to say. She was the headmistress, and when she was not telling us to face our problems, she was telling us to express our opinions, but never to be pushy. Pushy girls were the worst sinners in her book. They were to be abhorred. She would not tolerate pushy girls at Troy Female Seminary. She never explained to us how we were supposed to face our problems head-on without being pushy. I supposed it was a secret we would all learn someday. Oh, how often I wanted to run away! If it had been sixty years earlier, I might have dressed like a man and run for a pirate ship. In George Washington's time I'd have donned breeches and a rifle frock, taken up a musket, and joined a regiment to fight the British. Or gone west, over the Shenandoahs, to face the Indians. Where indeed I would have been pushy. But somehow I finished Troy Female Seminary, if only to keep from breaking my parents' hearts. They are considerably older than most parents are with a daughter my age. And being so, it is to be expected that their hearts are very fragile. I was reminded of that constantly by my older brothers, George and Albert. All my life I have done what my family wanted. I have performed and made them happy. Until now. Now I have broken out on my own. I have applied for a position at Mr. Washington's home as a sort of live-in caretaker. When I told my parents that it was backed by honorable people, they consented. And I got their friends the Maxwells and the Goodriches, who have money and influence, to write me letters of recommendation. Oh, I won't exactly be a caretaker. I will have servants and won't have to clean or scrub or even cook. But I will be making decisions about the house, which has long been neglected. Not alone, of course. Miss Cunningham, who is to interview me today, will be there. And a man called Mr. Upton Herbert. He is the superintendent. At least that's the way it was when I first wrote the letter to Miss Cunningham. But now things have changed. It is spring of 1861 as I sit here in my room of the Willard Hotel and write this. And South Carolina has seceded from the Union since I wrote that first letter. And war is coming. Things couldn't have changed more than that. But I feel safe here, as if things will turn out well. Even if Miss Cunningham is from South Carolina. And already she has written to me that she fears she may be needed at home. As if South Carolina has actually broken off from the continent and is about to float out into the Atlantic Ocean. But she has been honest with me. She has told me that Mount Vernon is in a dilapidated state. That General Washington's great-great-grandnephew, or whatever Mr. John Augustine Washington is, has left Mount Vernon by now, being the last Washington to have residence there, with all those children of his. Six, I think. She has told me she is not well, so likely it will be up to me to try to bring to the place some semblance of what it once was. But that is not what worries me. What worries me is that I have not been honest with her. And I am afraid she will find me out. I told her I was twenty-two in my letter. And I am only eighteen, going on nineteen. The Maxwells didn't mention my age in their letter. I know because I read it. Neither did the Goodriches. Not that they were conspiring. They just didn't. And my parents know nothing about the deception. No, the lie is all my own. So I sit here in my room and worry the matter. But I wouldn't stand a chance at getting the position if I hadn't lied. Oh well, it will all be over soon, and I will either shortly be hired or leave here in disgrace. And, as Miss Semple said, I must face up to the problem. Within the hour I am to meet with Miss Cunningham. I sit here writing in my journal. I think I shall try to keep a journal. After all, it isn't every day one gets invited to live in the home of the father of one's country. Something important may happen. And if it doesn't, then I must learn to make important the little things that do happen every day. I must learn that I am important. If I had learned that a long time ago, I wouldn't be living like a gypsy, getting shipped place to place by my family. But more about that later. Here at Willard's I have stayed in my room, fearful of taking to the streets, of even going into the lobby, advised against it by the concierge. "Congress is in session, miss. The halls, parlors, and dining room are loud and crowded. The din is frightful. We can deliver meals to your room." They say that to be seen here at Willard's marks one as important. They say they serve fifteen hundred of a Sunday when Congress is in session. But I keep to my room. I don't particularly want to be seen. I want to stay right here, away from it all. The Federal City is a bedlam. Everybody expects war to happen soon, and the streets are filled with office seekers, soldiers, plug-uglies, hangers-on, and if all that were not bad enough, the elite who have come to see and criticize our backwoods president. If Miss Cunningham does not approve of me, what shall I do? Go home to Troy to help Father plant the spring corn? 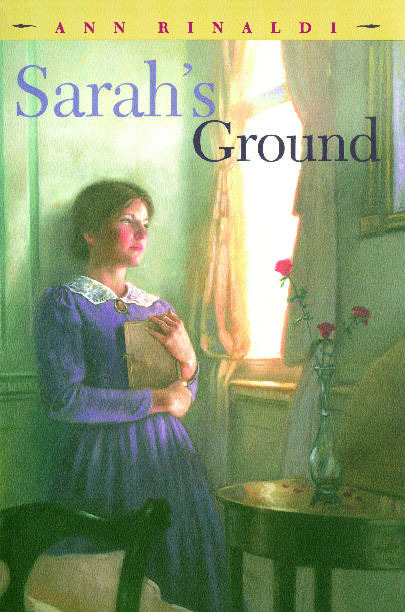 Go back to Mount Savage in Maryland to be a governess for the Maxwell children? I suppose I could stay with my friend Mary McMakin in Philadelphia for a while. Mayhap if Miss Cunningham doesn't like me, I'll run away to sea. It is terrible being the youngest in the family. I was never spoiled. I was admonished, preached to, and told by my much older siblings that I was the blessing of my parents' old age. And constantly reminded to act like a blessing. But being a blessing can be a tiresome business. My older siblings -- George, Albert, and Fanny -- raised me for the most part. When home from school, I mostly stayed at one of their houses or the other. Mother's heart really is weak. And Father lost his arm in the Mexican War. Still, he manages to be a gentleman farmer who owns the largest mercantile in Troy. My brothers run it for him. I think my older siblings put this burden of being a blessing on me so I wouldn't be a worry to them, or my parents. And never, never was I taken seriously about anything. I think that is why I am doing this. To be taken seriously. To have a part in what is going on around me. Of course, when I applied for this position, my sister, Fanny, didn't help my situation any. She's forever buzzing in my parents' ears about me. "You're going to allow her to be alone? In that place? I hear it's falling down around the superintendent's ears! And do you know who the superintendent is? They say he's the most eligible bachelor in Fairfax County. Mother, you're not going to let her go there!" Fanny really took on about it. Which I don't understand. Miss Cunningham will be there with me. And for two years, since I graduated from Mrs. Mercier's Academy for Young Ladies in New Orleans, after I completed Troy Female Seminary, my family has been shipping me about like a Christmas fruitcake to find a husband. And now that I pursue a position where there is a young man present, they are all ready to have me put in a lunatic asylum. I have not yet met the most eligible bachelor in Fairfax County, but he is safe from me. I must remember to tell him. The last thing I want right now, with war coming, is a husband. There are too many things to be done, not the least of them is to write a book. I really want to do that someday. I intend to do all of the things I want. But I started to tell how I've been shipped around. And if I'm going to keep a journal about my experience, I must be coherent. It was, of course, to find a husband. After all, what do you do with a young lady recently graduated from two of the nation's best schools, and possibly overeducated to boot? You ship her out. First there was six months at No. 1 Washington Square with the Grahams, friends of Father's, where I was touted as an excellent dinner companion and conversationalist. Three months with the Maxwells on Savage Mountain in Maryland in the summer -- not an official governess, no, but somehow I was always reading to, and looking after, the children. Another six months with the Goodriches in Philadelphia. Mrs. Goodrich is some sort of kin to Mother. And very wealthy. If I never go to another dinner party in my life, I shall be happy. If I never have to sit through another play in the theater, I shall be ecstatic. As for teas, soirees, hearing professors talk about Robert Burns or Sir Walter Scott, chaperoned walks in the park with insipid young men, I am sick to the teeth of all of it. "Mrs. Lincoln found her husband that way," Mother told me. "She was visiting her sister in Springfield, Illinois, when they met." "She was shipped there by her father and stepmother," I said. But I mustn't be saucy to Mother. Brother George would not tolerate it. I sighed. They might as well put a tag on my ear and ship me to Kentucky to a horse auction. Let my husband look for me, is what I say. Oh dear, I wonder what Miss Cunningham will be like. I know she wants someone educated, bright, agreeable, and ready with her pen and her tongue. Well, I'm all that. Most times Fanny says I'm too ready with my tongue. I must watch myself. When Miss Cunningham wrote back setting up this appointment, she sounded so befuddled, poor lady, worrying about the war that was warming up on the horizon, worrying about getting home to South Carolina, worrying about her eyes, which give her no end of trouble, and her sister's boy, who was going to join up. Let's hope, Lord forgive me, that her eyes are not that good, so she won't see my youth. I'm counting on that. "We need someone of stout purpose and solid values," she wrote. Heavens! I'm not applying to be secretary to President Lincoln! I told her she had that person. She would soon be looking at her. Though my purpose in life has never been stout, between Troy Female Seminary and the academy in New Orleans I learned enough life values to choke a hungry mule. What I need is a place to put them to work. I need not to be shuffled around anymore, from family friend to family member, like one of Professor Thaddeus Lowe's balloons. I saw one the other day. Near the White House. Was he demonstrating it? Some people say he is mad, others say he is heaven sent. His wife runs around with a wagon and meets him and helps him cart it off. As it is, the only man I ever felt an attraction for was Charles Mercier. His mother ran the school in New Orleans. He was quite the most handsome young man I ever met, and if I ever intended to marry, I had decided that I would marry him. He never talked about Robert Burns or Sir Walter Scott. He didn't like plays. His open, friendly face was always ruddy because he was always outdoors. He wanted to raise horses. He was crazy about his horses. And he was sent to a military academy because of me. Because we walked the streets of New Orleans unchaperoned one evening. There was talk. And talk is the worst thing a proper young woman from a proper family can afford to let happen to her. The whole school and all Mrs. Mercier's high-toned friends and the parents of her students were gossiping. And then it all came out that we'd been sneaking out to meet. And it was then that I decided to leave. To spare her the censure of her high-toned friends. To allow her to keep her students. Charles and I scarce knew each other, now that I think of it. We hadn't even kissed. All I knew was that he was tall and that his face held all I wanted to know of the world at the time. His eyes were on speaking terms with the stars. His mouth, oh, and how dear and gentle of manner he was, with just enough sadness in him to bring out a girl's mothering instincts. Was it puppy love? I don't know, but I have lived through it, and I don't wish ever to be in love again, thank you. And I shall always remember him as being dear and good. Oh, it is almost time to go down and meet with Miss Cunningham. I must straighten my hair and look of stout purpose. I must stare my problem in the eye.